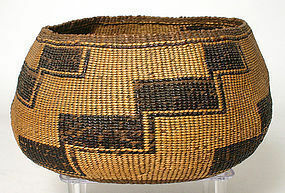 Hupa woven storage basket, Northwest Coast of California, c.1880. Size: 9.5 inches diameter x 5 inches ht. Tightly woven from alder on a hazelnut and willow warp with a dyed 'step design' in black. Good condition with tight weave and nice signs of use. 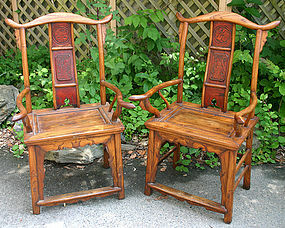 Pair of Chinese yoke back arm chairs. Late 19th century. Shanxi province. Elmwood. 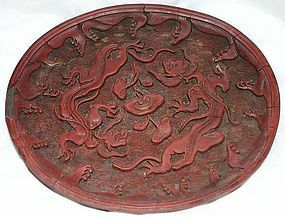 Dimensions: 43.5 inches height x 25.25 inches width x 22 inches depth. Seat height is 19.5 inches. Each chair has a back splat with carved figural panels. Condition: repair to break on one arm, replaced glue blocks on undersides of seats, some scuffing to one side stretcher on base. Structurally sound. 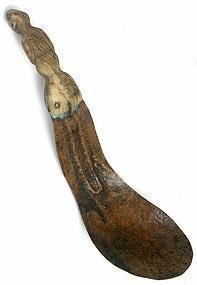 Antique Native American folk art female doll. Size: 10.5 inches ht. 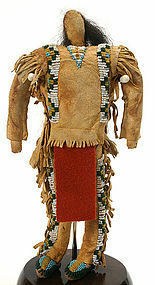 A Northern Plains Indian antique doll fashioned from brain tanned buffalo hide with buffalo hair stuffing, a tack decorated leather belt and human hair. It has fully beaded moccasins and beaded fringed garments. Sinew sewn and with colored glass beads. Excellent condition (some thinning to hair). Display stand included. Also available as a separate offering is a male companion doll. Antique Male Native American folk art doll - Northern Plains origin. Size: 10.5 inches height. 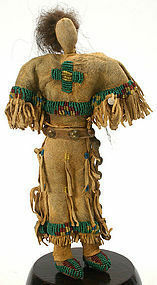 This doll is fashioned from brain tanned buffalo hide with buffalo hair stuffing, red trade cloth and human hair. Fully beaded moccasins, leggings and beaded fringed garments. Sinew sewn. Excellent condition. Display stand included. 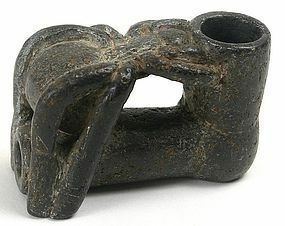 Also available as a separate offering is a similar female companion doll.